For everyday use choose from polypropylene tape, available as economy tape or standard parcel tape, acrylic low-noise adhesive tape or premium top quality vinyl packing tape. 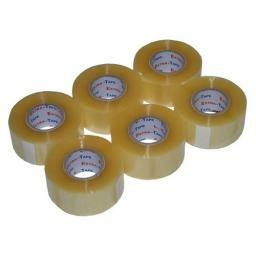 All these packaging tapes come as clear or brown tapes and are ideal for securely sealing light to medium weight cartons and boxes for transport, shipping, or storage. The Carrier – Polypropylene or PVC, this is the backing material of the tape. PVC is hand-tearable and a premium backing, whereas polypropylene requires a dispenser and is more commonly used for general purpose. The Adhesive – Acrylic, Hotmelt, or Solvent, this is the part that makes it stick! Certain adhesives are better for certain atmospheres or temperatures.